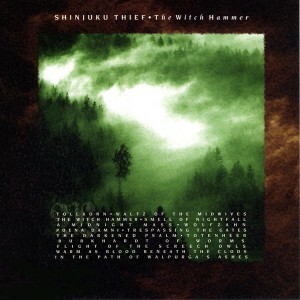 Shinjuku Thief’s 1993 opus, The Witch Hammer, is a classic Gothic Industrial Electronic Ambient masterpiece paying homage to German expressionist film of the 1920’s and supernatural horror from the 1500’s. Dark, orchestral timbres set into rich soundscapes, interspersed with outbursts of violence and power. Shinjuku Thief is the musical identity of Australia’s Darrin Verhagen. Verhagen holds a masters degree in sound from the Royal Melbourne Institute of Technology and has recorded nine albums of dark ambient/postclassical/ experimental music. His commissioned work has provided the score for numerous dance, theatre and film productions. In addition to recording under the name Shinjuku Thief and other aliases, Verhagen releases other similarly experimental artists on his own label, Dorobo. “bizarrely enticing” – ALTERNATIVE PRESS and an “excellent work on a biblical scale.” -AUDIODRUDGE.